Graphic Novels, Tough Chicks is an original feature that celebrates the amazing female characters that abound in graphic novels. While many people still associate this particular form with a male readership, certain graphic novels empower women and combat feminine stereotypes through illustration and text. Tough chicks resist injustice, fight for their beliefs, and they don’t take flak from nobody. These women are capable of fighting their own battles, both literally and figuratively. My thanks to Image and NetGalley for providing me with a digital review copy. No compensation was provided for this review, and all opinions are my own. Suburban drama and otherworldly mysteries collide in this smash-hit series about nostalgia, first jobs, and the last days of childhood. If you’re in the know about comics and graphic novels, then you’ve read at least one series written by Brian K. Vaughan (Saga, Runaways, Y: The Last Man) – and if you’re not in the know, then you’ve likely still heard about some of his projects. The writer is back at it again with a new genre bending series featuring young women who are undoubtedly tough chicks. The year is 1988, and 12 year-old Erin Tieng is one of the few newspaper delivery girls in her sleepy hometown. Quiet, studious, and lonely, Erin gets ready for work on the morning of November 1st knowing that she’ll have to deal with all the garbage left over from Halloween celebrations – including dreaded teenagers. It’s during an unpleasant encounter with said teens that Erin experiences what I can only describe as my personal dream come true: she is initiated into a bike-riding, smack-talking girl gang. JEALOUS! Tiffany, KJ, and Mac are all paper girls too, and they know that there’s safety in numbers when weird stuff goes down on Halloween. But as the girls ride through their routes, they realize that there’s something extra weird going on this year. Accosted by ninja-like dudes who speak gibberish and want to steal their walkie-talkies, the girls then witness their neighbours, friends, and family members just…disappear into thin air. As if that weren’t enough, they’re confronted by a pair of deformed, cyborg-like teenage boys who claim that they’re from the future – and that they need the girls’ help to stop the ninja dudes and save the missing townspeople. So not your average morning at work, clearly. PAPER GIRLS VOL. 1 illustrates the realities of being a woman in a male-dominated society or micro-society, in this case working as a paper girl. Erin is subjected to aggression and sexual harassment from male characters, dealing with crass innuendos and unwanted overtures from teenaged boys…when she herself is only 12. As she implies in the panel above, Erin just wants to do her job without being harassed. I think this is a sentiment that a lot of readers can relate to, especially women in male-dominated fields (or any customer service role). Despite some cheesy ’80s, John Hughes movie tropes, PAPER GIRLS VOL. 1 presents a quiet, powerful feminism from the perspectives of girls who may lack the sophisticated language to articulate it but nevertheless know that what they’re experiencing isn’t right. I was really pleased with this element of the graphic novel, especially coming from an entirely male creative team. I’ve spoken about this before, but queer representation in SFF is really important to me as both a reader and a reviewer. 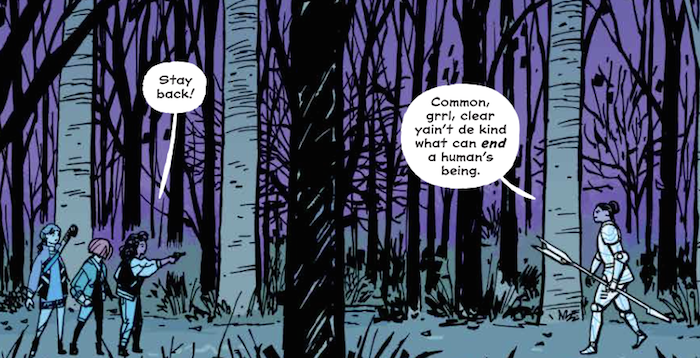 BKV has built a representation for portraying queer characters and relationships in a complex and nuanced light, so I was very taken aback by the fact that there are homophobic slurs in PAPER GIRLS VOL. 1. But then I remembered – this is set in the 1980s, at the height of paranoia about AIDS and its links to the queer community. One of the paper girls named Mac, a rough-edged girl from the wrong side of the tracks, calls people “faggots” and uses derogatory references to HIV/AIDS as insults. Thankfully, Mac’s behaviour is not condoned in PAPER GIRLS VOL. 1 nor does it go unremarked upon: Erin calls her out for her homophobia and the other girls are visibly uncomfortable with Mac’s homophobia. But if you’re a reader who’s sensitive to homophobic slurs, you should proceed with caution. Language and communication are actually central themes throughout this volume, as each group of characters has a specific dialect. 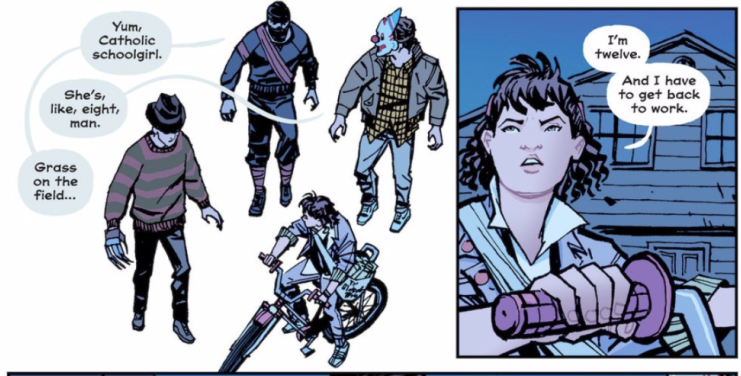 The mysterious, space-age adult warriors speak a kind of Pidgin English; their enemies, the technophile teens from the future, speak a completely different language; and the paper girls’ speech is littered with 80’s slang and pop culture references. I’m not totally sure where the story is going to take these themes since we’re only on the first arc, but I liked what I saw and I’m curious to find out more! Have you read anything by Brian K. Vaughan? What are your favourite feminist comics? 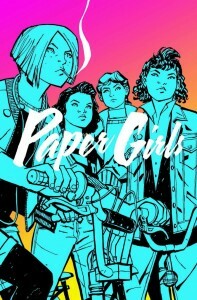 Do you plan to read PAPER GIRLS? I really liked Runaways and Y: The Last Man. I’ll be sure to check this out too! Regarding the slurs and 1980s stuff — I kind of enjoy consuming things that are either set or made in the past, since it can give some intense perspective on how cultural attitudes have changed. I definitely get warning readers though… I remember that I had a tough time making it through the beginning of the movie, Breakfast at Tiffany’s. I still have to read Y: The Last Man! Definitely agree re: getting a feel for how attitudes have changed, but sometimes my modern sensibilities do get offended, haha. Hence my relief that characters don’t accept the slurs in Paper Girls. Ugh, Breakfast at Tiffany’s is such a racist movie. I can totally see why it affected you! I’ve been meaning to read Saga forever, but now I really want to read this one! I’m glad that behaviour regarding homophobia and slurs isn’t condoned. That’s really important to me too, but I do appreciate being taken to a different place, a different period of time. Ooh, if you’re torn between this one or Saga you should probably start with the latter just because the plot is stronger in the first volume. BKV did a good job with the historical fiction angle, I really did feel transported! Yes, definitely give it a shot! It seems to be pretty polarizing so far so I’d be interested to hear your take on it. I had a completely different reaction to this volume. I thought there was too much going on with not enough there to emphasize with the characters. But you pointed out some interesting points about the themes explored. Great Review! This one has been getting very mixed reviews so I’m not surprised you had a different experience with it – sorry you didn’t enjoy it more! 🙁 I did really love the themes though, and hopefully vol. 2 will be more organized. Haha yeah! I read them on my iPad but I think any colour ereader would work, or a laptop otherwise maybe. But a laptop would be pretty clunky! This definitely sounds like something I should pick up soon. I might wait for a collection of some sort, just so I don’t have to wait for each individual part to arrive (I think I’ll be buying paperback copies of comics for now, I’m still a newbie and can’t really imagine reading them on-screen). Thanks for mentioning the homophobic slurs issue, I would probably miss the fact that the story is set in the past and would be seriously miffed by them. Good call, I usually wait until trade paper volumes are released too because single issues are so pricey! Of course! I was really shocked and mad at first, and I know some readers where taken unawares by them and didn’t appreciate the surprise. I want to read this one so bad but I’m trying to resist buying anymore books…for the moment.